First time sharing here and would definitely appreciate any constructive criticism- always looking to optimize and improve. Over-sharpened for IG and backgrounds replaced. Very graphic and interesting. Welcome, and keep putting up images! These all look good, once I got past the funny face watermark. What was the nature of the update? Haha, sorry; these were just ready go. The people in the cannabis industry aren't very versed(or care) regarding copyright so they take images left and right. I plaster a logo right in the middle as a small layer of protection. I have another post somewhere and another member stated interest in seeing more. Concon, these are interesting and well executed. Thanks for posting! Must admit that I find "updating" somewhat disorienting, as I can't compare "current" with "before." And admit to finding the watermarks a bit disconcerting--though I sympathize with your desire to avoid image theft. 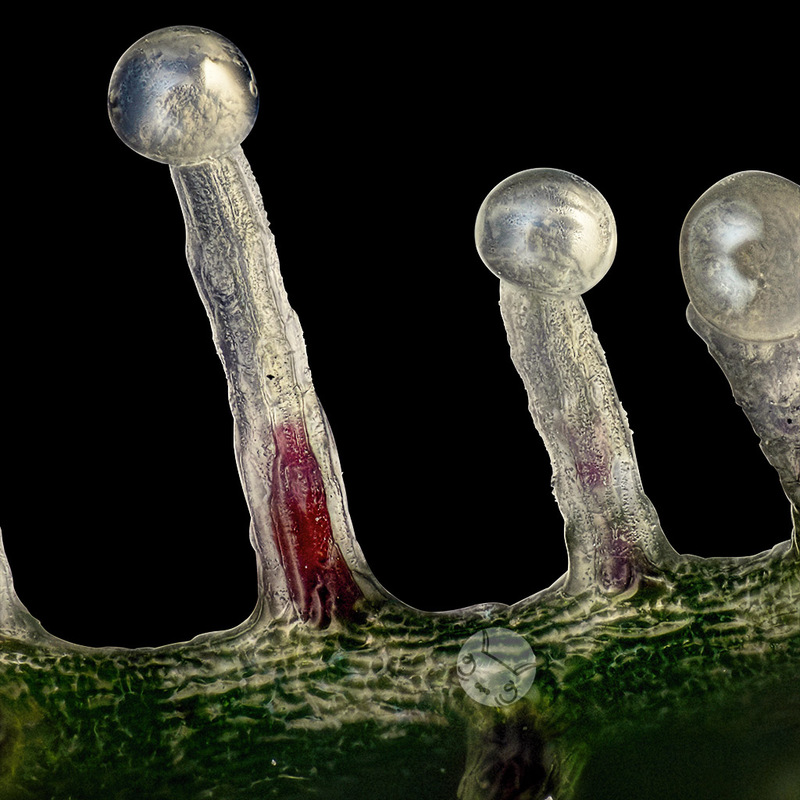 What is the red juice in the trichomes shown in your fourth image down? 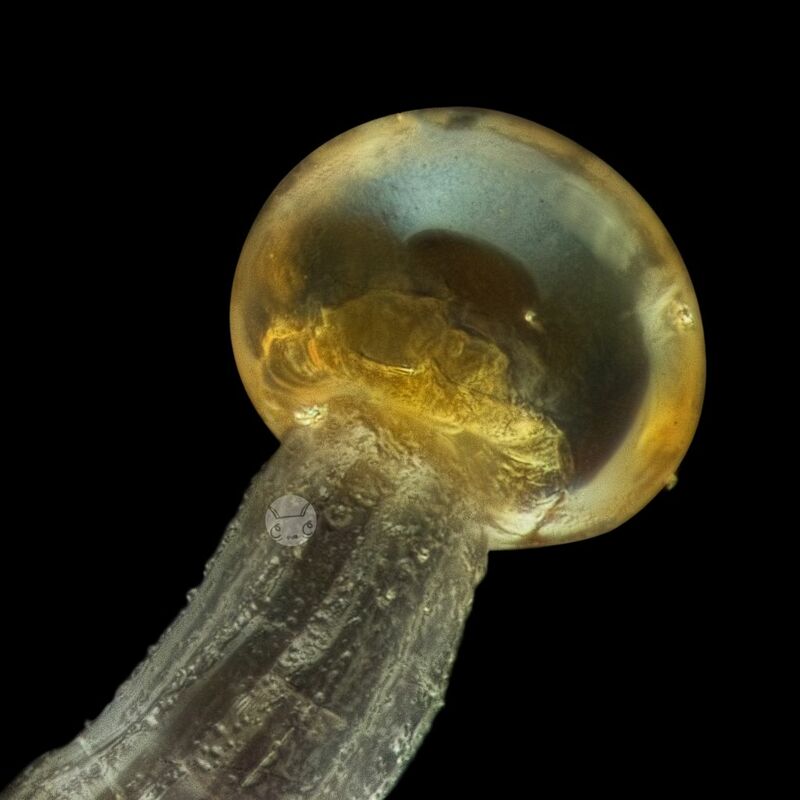 Does it start out filling the shaft of the trichome, then recede as the sample dries out? Can you discuss the color differences--clear, greenish, golden--are these representative of differences between cultivars, attributable to the lighting, or something else? The red in the stalks are anthocyanins. They're pigments that can be a variety of colors, but they're mainly red in cannabis due to pH control. 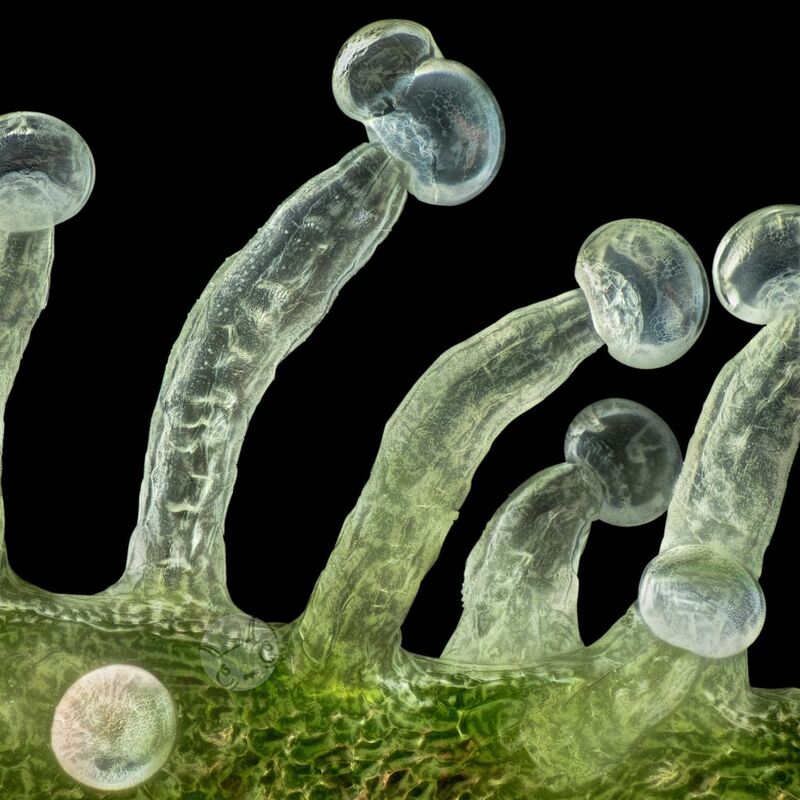 They can appear in the leaf cells or certain(capitate-stalked) trichome stalks- very rarely they'll push up to the cells that connect the head to the stalk (basal and stipe cells). The cannabis community DIES for reds/purples- it's a desired aesthetic trait. The presence and location isn't affected by dryness as much as a variety of other variables that haven't been isolated. It's mostly dependent on genetics as some strains will never exhibit any reds or purples. Until recently, I've had a hard time getting my hands on samples to shoot and pursue personal research. There were a few things I wanted to look into with all my might- the differences in head color/activity compared to cannabinoid contents. Cannabinoids are the most desired molecules and are primarily in the heads. They'll go through various transformations throughout a plant's life. Growers have referred to head color for ages as the measuring stick for when a plant is ready to be harvested- 'wait until it's amber'. Through my personal observation I've documented that cloudy/bubbly heads are most prevalent during the earlier weeks of the flowering stage (I'll now be able to see which cannabinoids are most present at this time with the help of the lab). Ambering occurs towards the end of the flowering cycle, which is dependent on strain/genetics. An interesting thing regarding the ambering is that it actually occurs at the base of the head and top of the stalk, at the basal and stipe cells. The color is then reflected into the head and to the naked eye it appears as if the whole head is amber. 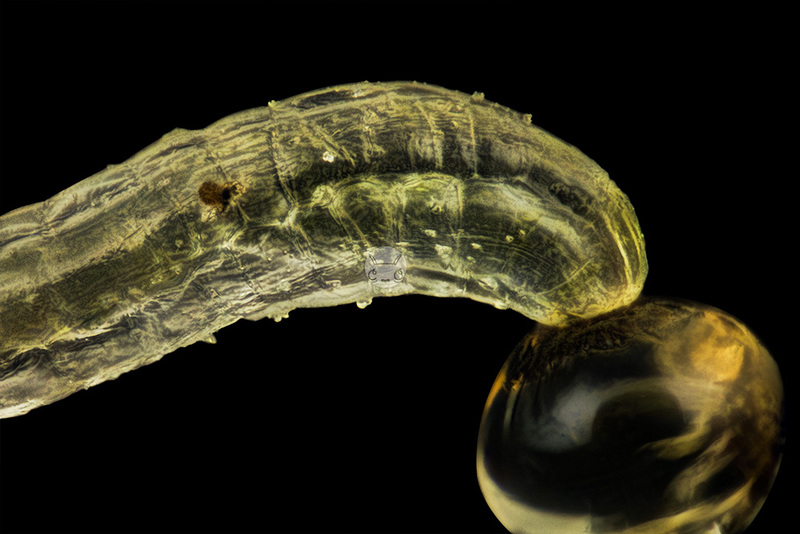 Depending on viewing angle an older trichome can appear clear or amber. This is a semi-recent discovery made by my mentor that we've been able document many times again. 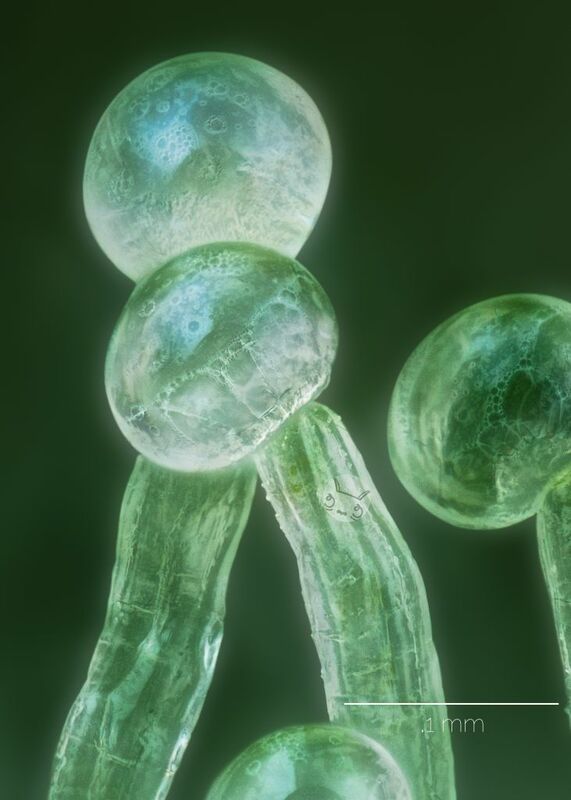 Most of the trichome is transparent, mind the shadows caused by depth changes, various vacuolar molecules, whatever is behind it, and the base of it. I think most of greening I capture in the stalks is due to depth differences or shooting against the leaf. A few months ago I was stepping through a stack and noticed a bit of cytoplasmic streaming. I've since seen this in a good amount of my higher magnification stacks. I retouch as needed, but thought it was worth sharing as it was fairly interesting; I'm looking into a way of getting enough light to capture a video.